“Something sure as hell happened..."
Dr. J. Allen Hynek was only indirectly involved with the Cash-Landrum case, but he knew it well. From the beginning, John F. Schuessler was sending copies of his Project VISIT reports to Hynek’s Center for UFO Studies (CUFOS). In April 1981, Dr. Hynek’s protege, Allan Hendry, (CUFOS’ chief investigator) was contracted by the Fund for UFO Research (FUFOR) to investigate the incident. Further, Schuessler made his first lecture on the case at Hynek’s CUFOS symposium in September 1981. While Hynek himself did not investigate the case, he was very familiar with it. In 1981, just as the news of the Cash-Landrum story was spreading through mainstream media, Dr. Hynek was contacted by a Texas newspaper, the Corpus Christi Caller-Times for his comments on the case. Hynek believes the women should file a lawsuit to compel disclosure. The year before he died, Dr. Hynek was interviewed at length by Pamela Weintraub of OMNI magazine, it appeared in the February 1985 issue. A number of UFO cases were discussed, and in a rather surprising way, the conversation turned to the Cash-Landrum case. Omni: ... close encounters of the third kind might be anybody's fantasy. Hynek: I can't disagree. That's why I'd like to focus most of my new research on close encounters of the second kind, where there are actual physical marks. -Perhaps a foreign consciousness is creating not just illusions but the real ship and the-real creatures as well. If they weren't physical creations, they couldn't leave traces. That's the importance of the close encounter of the second kind. Let us suppose that a very, very advanced civilization has, as a part of its everyday technology, the ability to project a thought form that, like a holographic image, temporarily assumes three-dimensional reality. This is just speculation of the wildest sort, but if the UFO phenomenon is doing anything, it's causing us to expand our imagination, to make us aware that this nice, cozy world we live in is only the world we see around us, not the sum total of our environment. Omni: Are there any close encounters of the second kind that you feel would particularly help to reveal this broader reality? Hynek: I'd like to get to the bottom of the Cash/Landrum affair. The story there concerns Betty Cash, Vicki Landrum. and Vicki's grandson Colby The three were coming back from a Bingo game when they saw a glowing triangle spewing flames above them in the sky. They stopped the car to watch the thing, and as it moved off, they reportedly saw about twenty-three helicopters escorting it out. After they got home there were all sorts of physiological effects: Their eyes swelled, their hair fell out, they developed blisters, they were nauseated and weak. The event completely altered their lives. Omni: What do you think was at the root? Hynek: My best guess is that they were exposed to some kind of microwave radiation. Space-shuttle engineer John Schuessler, who's investigating the case, is veering toward the idea that the three were exposed to a government device escorted by twenty-three helicopters, He's even helped Betty, Vicki, and Colby to institute a lawsuit against the government. But there's another side of all this: Where would twenty-three helicopters come from? First of all, it was Christmas week, and people at the bases said they would never conduct military exercises at a time like that. Omni: Certainly you can't be suggesting the possibility of twenty-three extraterrestrial helicopters? Hynek: No, that's preposterous. But perhaps Cash and the Landrums saw a holographic image of the helicopters. I could buy that more than I buy twenty-three solid, physical helicopters from some unknown base, when no baseman will admit seeing so many helicopters of that particular kind. Omni: Yet I really think that we're obliged to consider the fact that some of these sightings are due to government craft. Recently, James E. Oberg traced many reports to secret Soviet satellite launchings. Hynek: Today, of course, such technology may account for many reports. From 1947 through 1955, however, almost none of the maneuvers ascribed to UFOs could have been duplicated with human technology. And even today, our technology can duplicate only part of the phenomenon. We still don't have craft that can hover and then take off at fantastic speed. Omni: As far as you know. But the government has been implicated in other ways as well. A group known as CAUS [Citizens Against UFO Secrecy] claims that the government has been orchestrating a massive cover-up of UFO information. They've recently invoked the Freedom of Information Act to obtain classified information. Have they found anything, and do you believe there's a government cover-up? Hynek: What can be covered up? You can cover up ignorance, embarrassment, sinister political acts. I myself don't see real evidence for a diabolical, Machiavellian cover-up. I do perceive a strong reluctance to share information with the public. 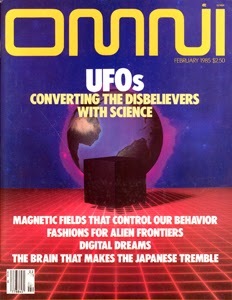 Omni Magazine February 1985 interviewed by Pamela Weintraub.